Originally published on Torontoist on March 13, 2012. Toronto World, February 23, 1913. Can you name all of the body parts represented by letters in the illustrations above? Do you think this ad makes crystal clear Dr. Blosser’s claims that his tobacco- and narcotic-free herbal smoke relieves catarrh? Are you confused by the length to which the illustrator attempted to prove Dr. Blosser’s superiority over other remedial aids? Backed by personal endorsements from prominent Atlanta citizens, Blosser claimed that Adams would be “utterly unable to sustain by proof” that any letters were sold. Adams contacted a New York–based letter broker, who had more than 113,000 letters sent to Blosser’s company ready for purchase. No legal action appears to have followed. Blosser’s remedy, usually sold as herbal cigarettes, remained on the market for decades. Later ads dispensed with the detailed diagrams, forcing the illustrator to seek work in the scientific textbook field. Additional material from the fourth edition of The Great American Fraud by Samuel Hopkins Adams (Chicago: American Medical Association, 1907). Originally published on Torontoist on September 27, 2011. Toronto World, May 21, 1902. Toronto World, May 14, 1902. By the time Adams uncovered “The Great American Fraud” of patent medicines in a series of articles for Collier’s Weekly, Toronto-based Powley’s Liquified Ozone had been bought by an American named Douglas Smith, who moved its operations to Chicago and renamed the product Liquozone. Under its new label, the product’s claims grew more exaggerated, its testimonials more suspect. J.B. Banks and Reverand C.A. Coakwell may well have written testimonials, but they also might have included complaints that were crossed out with a blue pencil. Respected institutions like Chicago’s Hull House denied providing the glowing recommendations that accompanied ads. A creative copywriter invented the tale of the remedy’s supposed inventor, a German named “Dr. Pauli” who endured 20 years of poverty and ridicule while perfecting a method of liquefying oxygen to revitalize sick souls. By the time Adams’s series reached print, Liquozone was banned in jurisdictions ranging from Kentucky to San Francisco. We suspect its fortunes in Toronto were also affected by the bad publicity, as advertising of Liquozone in local papers ceased by spring of 1906. Originally published on Torontoist on November 30, 2010. Mail and Empire, April 11, 1896. While modern medicine would likely have reservations about the true effectiveness of Paine’s Celery Compound, one thing was for sure: with an alcohol content of up to twenty-one percent, several spoonfuls would have dulled the user’s misery for a few hours. Paine’s Celery Compound was created by Windsor, Vermont druggist Milton Kendall Paine from a combination of celery seed, camomile, sugar, and assorted barks and roots. After some local success, Paine sold the formula to Burlington, Vermont–based patent medicine manufacturer Wells & Richardson in 1887. By the end of the 19th century, the formula was advertised across North America through the time worn method of testimonials. The stories provided by users like Mrs. McMaster outlined the precarious state of their health before downing their first dose of Paine’s. As for the statement Mrs. McMaster supposedly gave to a Star reporter? From the evidence we’ve dredged through, all we’ve determined is that this ad appeared in the Star the same day as it did in the Mail and Empire. Originally published on Torontoist on September 7, 2010. Left: the Globe, April 23. 1904. Right: the Telegram, May 11, 1904. For a product designed to enhance the beauty of early twentieth-century women, Dr. Charles might have chosen a name that better delivered his aim of enhancing one’s attractiveness (without drawing the ire of prudes) than one which now sounds more appropriate for a horror yarn (“What was the terrifying secret of Dr. Charles’ Flesh Food?”). Simpson’s prominently featured the beauty aid in several of its daily newspaper ads with assurances that the Flesh Food “received unqualified praise from all who have used it.” While the department store claimed that “it is made of the purest materials from the prescription of a celebrated physician and is thoroughly endorsed by the medical profession,” the American Medical Association begged to differ. A report on the product noted that “whatever Dr. Charles’ Flesh Food may lack in therapeutic efficiency, it makes up in colo[u]r and odo[u]r. The preparation is a highly perfumed, pink ointment.” For those wishing to recreate Flesh Food in your home laboratory, you’ll need starch, Vaseline, a dab of zinc oxide, and a few drops of “impure stearic acid,” along with your choice of perfumes and colouring agents for prettifying or horrifying effects. Additional information from An Annotated Catalogue of the Edward C. Atwater Collection of American Popular Medicine and Health Reform Volume III, compiled by Christopher Hoolihan (Rochester: University of Rochester Press, 2008), and the July 16, 1904 edition of the Toronto Star. Originally published on Torontoist on January 12, 2010. Toronto Star, March 5, 1915. Trusting the judgment of her faithful nurse, the morose, near-suicidal patient took the tipple of Wincarnis. And another. And another. She wasn’t sure if the promised “new life” ran through her veins, but at least she was temporarily distracted from the other pressures of this mortal coil. Wincarnis derived its name from its mixture of wine and meat byproducts. It was a snappier branding than the one it bore when introduced in Great Britain in 1887: Liebig’s Extract of Meat and Malt Wine. The current manufacturer continues to tout the medicinal qualities of the herbs and vitamins mixed into Wincarnis, even if it is officially marketed as an aperitif instead of a cure-all. We’ve also read that it tastes great mixed with Guinness and milk. Originally published on Torontoist on April 27, 2010. Toronto Sun, August 29, 1983. Thirty years after this ad teased Toronto Sun readers, the phrase “golden girls” may not conjure up a night in a peeler joint, unless you’re a fan fiction writer willing to place the sitcom characters in such a setting (though given Betty White’s willingness to do anything lately, it might not be that great a stretch to imagine her in pasties and a g-string). Besides overemphasizing the hair colour and lusty potential of the dancers, we wonder if club management had a soft spot for a classic Bob Dylan album. Would the non-blonde (unless the newsprint is lying) Viki Page have titillated her audience to the strains of “I Want You” or “Just Like a Woman”? Would the urging to get stoned in “Rainy Day Women #12 & 35” combined with the lack of accessories on the dancers have caused club clientele to drop all discretion? Later nightclub incarnations at the same address include Uberhaus, Tila Tequila, and Moda Night Life. Originally published on Torontoist on June 1, 2010. Today’s ad is for readers who are puzzled whenever bags appear under the headlights of their vehicle that aren’t caused by scratches bestowed by other drivers exiting a tight parking space or provided by a bird in an artistic mood. Fret not: oilcers can be cured (however, that puddle of stomach battery acid on the ground might be a different story…). Originally published on Torontoist on July 13, 2010. Yes, this businesswoman is free to go…into the afterlife, that is. The glowing lights and yellow arches welcome her to whatever awaits after she shuffles off this mortal coil (though it looks like it will resemble a 1980s ad designer’s dream). She should have taken it as a warning sign when the pressure of balancing so many communications gadgets sitting atop her head, day after day, caused her face to assume a grape juice–like complexion. Poor Robert will receive neither a reply about the breaking developments with the coffee supply contract, nor will he receive the page she was preparing when her brain caved in. National Pagette was acquired by Shaw Communications in 1995. At the time, it was described as Canada’s largest provider of telephone answering services and sixth-largest paging company. Vintage Toronto Ads: Self-Denial or Lighting for Tourists? Originally published on Torontoist on February 23, 2010. Toronto Star, May 2, 1930. Picture yourself as a downtown shopkeeper heading home after a busy May afternoon eighty years ago. After locking up, you stop by the corner newsstand to pick up the evening edition of the Daily Star. Looks like it’s your lucky night: there’s an empty seat on the streetcar. Making yourself comfortable, you flip through to see if there’s any word on how last night’s Board of Education vote on the confirmation of a director at your son’s high school went…ah, there it is, wedged onto page thirty-three between accounts of a car wrapped around a telegraph pole at Bloor and Parliament and a woman who suffered a fatal “illegal operation.” Before you dive into the article, two ads on opposite sides of the page catch your eye. On the left side of the page, there’s the Sally Ann urging you to deny yourself some small pleasure in life so that their enlistees can rescue a shifty man reduced to liberating boxes wrapped in plain brown paper. On the opposite side, there’s the Toronto Hydro Electric System urging shopkeepers like you to invest in fancy window-display lighting to draw eager tourists ready to spend money into shops like yours. You ponder both of these pitches for a moment—despite the worsening economic climate, your business is doing well enough to have extra money to toss around. In the battle between your commercial and humanitarian instincts, which will win? The answer is neither. You read about the school vote, then flip to the sports section and decide which horse races to consult on with your bookie. Here are the other stories this post alluded to, all taken from page 33 of the May 2, 1930 edition of the Toronto Star. During this era, “illegal operation” tended to be code for an abortion. Northern Vocational School welcomed its first students later that year. It evolved into today’s Northern Secondary School. One of the trustees mentioned in the article, Adelaide Plumptre, had a distinguished public service career. Her milestones included serving as superintendent of supplies for the Canadian Red Cross during the First World War, a city councillor, and the first female chair of the Toronto Board of Education. 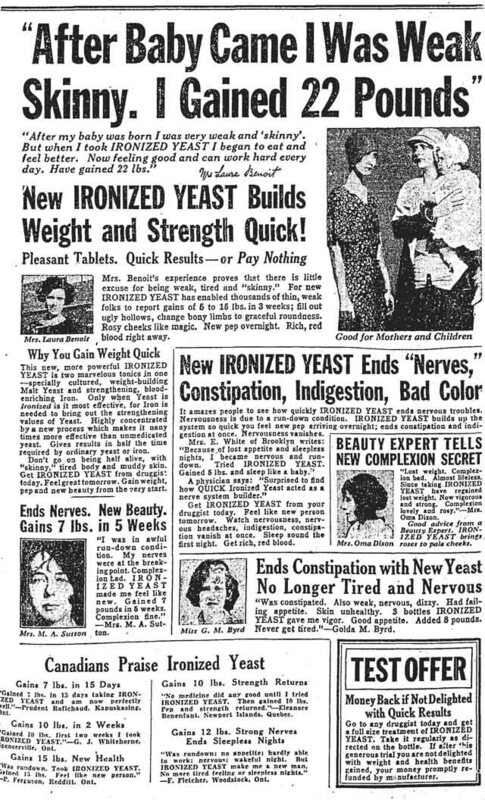 I’m kind of dubious about the true benefits of ironized yeast. Finally, this piece of advice/words of wisdom/space filler appeared in the middle of the page, below the illegal operation story. Author Jamie BradburnPosted on November 7, 2017 November 7, 2017 Categories torontoist, vintage toronto adsTags 1930s, adelaide plumptre, charity, conventions, education, illegal operations, ironized yeast, northern secondary school, northern vocational school, quack medicines, salvation army, self-denial week, toronto hydro, toronto hydro-electric system, toronto star, words to live byLeave a comment on Vintage Toronto Ads: Self-Denial or Lighting for Tourists? Originally published on Torontoist on February 16, 2010. National Home Monthly, May 1935. While it may seem laughable now, for much of the twentieth century Lysol was marketed as a solution for feminine problems as often as for its all-purpose cleaning properties. Genteel women had no patience for normal feminine odours, vaginal infections, and other bodily functions not discussed in polite society. Through carefully coded language, Lysol offered itself as a solution that preserved one’s grace and dignity, using chemicals a body shouldn’t come in contact with internally. The reference to “organic matter” in ad number one is likely code for contraception, as openly advertising birth-control methods was a no-no. Ad number two was directed at married women who worried that their non-dainty attributes caused their husbands to sleep on the couch. One dose of Lysol and her “romance appeal” and “married happiness” would return in a jiffy! Besides, how could she not trust the recommendation of a distinguished-looking medical professional? Answer: she shouldn’t, as an investigation by the American Medical Association revealed that the “European” doctors often quoted in Lysol ads were fakes.